It’s almost time to pull out your cashmere scarves and leather gloves! Autumn is just in our horizon, and we’re loving it. After watching this year’s Fashion Week, we have designed some of the hottest trends for your temporary tattoo needs this Autumn. Fashion accessories that range from metallic tattoos to beautifully bold bracelets, we have all of your newest obsessions ready to go this season! Our Metallic Crest Leaves is the perfect statement necklace! Celebrities are in love with metallic temporary tattoos, so why stop after just one season? Our new Metallic Crest Leaves are meant to be a fashion accessory that stands out! Wear this temporary tattoo around your neck for that bold statement piece or take half of the tattoo and wrap it around your wrist for a fall-favorite bracelet. 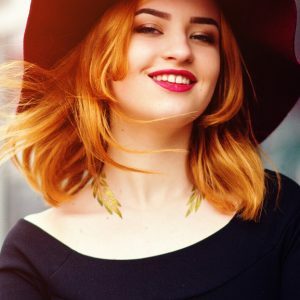 During the Ancient Greek and Roman times, laurel leaves were symbolic of victory, so show the world how victorious you are as you look like royalty! These changing maple leaves are sure to give you the Autumn feels! Our new Maple Leaves Sleeve temporary tattoo is a literal representation of the kind of feels Fall is supposed to give you! With vibrant hues of red and orange, this sleeve showcases falling leaves as the seasons change. When you take your jacket off or wear a mid-sleeve shirt have this colorful tattoo give you that same pop of color. 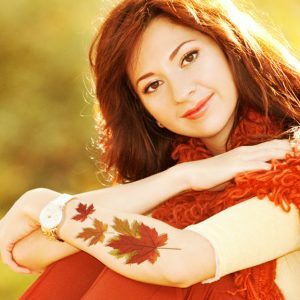 Wrap yourself up in a blanket with some hot cocoa as you look to the falling leaves of Autumn, oh wait that’s your tattoo! If you’re from Canada then this tattoo is meant for you, and we’re not sorry about it! If you’re looking for a feminine, yet subtle tattoo that showcases Fall then look no further than our Autumn Acorn Bracelet. In black and white, this tattoo follows the minimalist trend that we are loving for new tattoos. With the hints of holly and acorns, this tattoo has all of the elements that have Fall written all over it. Wear this tattoo around your wrist as a bracelet along with a metallic watch or add it as a part of your stacked bracelets collection like this Acorn Alex and Ani bracelet. This Sunflower temporary tattoo is sure to make you shine! A perfect transition from Summer to Autumn are sunflowers! The sunflower is a symbol of adoration and loyalty that derived from the Greek myth of Clytie and Apollo. If you’re looking for a simple, realistic form of the beautiful sunflower then look no further than our Sunflower temporary tattoo. This tattoo is small enough to stand out without overwhelming your fall fashion. For the real trend-setters, our Sunflower Black & White temporary tattoo is perfect to wear on the back of your neck or your inner arm for that touch of beauty. When you’re sitting next to the fireplace, these tattoos are sure to make a simplistically bold statement. As we tap into our love for nature this Autumn, we are obsessing over our new Metallic Gold Leaf Bracelet. This temporary tattoo goes on like a cuffed bracelet but gives the look of intricate leaves wrapping around your arm. With the metallic gold finish, these leaves are anything but ordinary. Wear this bracelet around your wrist when you’re draped in an over-sized sweater, leggings, and over the knee boots. This bracelet will pop out of your sweater giving you that hint of “ I’m fabulous”. As you’re shopping for new statement pieces to update your wardrobe this Autumn, check out our Pinterest board for some extra inspiration! 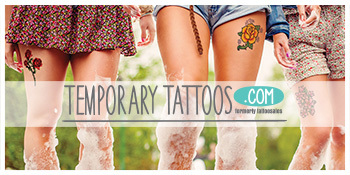 Don’t forget to tag us on social media @temporary.tattoos with your new fall fashion tattoos!